The Dominican Republic is a nation on La Hispaniola, and thus is part of the Greater Antilles archipelago in the Caribbean. The Dominican Republic is the second largest nation in the Caribbean, after Cuba. The Dominican Republic's capital is Santo Domingo. The numerous golf-courses in the Dominican Republic attract golf tourists throughout the year. The highest mountain in the Caribbean, Pico Duarte, and the biggest lake, Lake Enriquillo, are both in the Dominican Republic. With an average temperature of 25 degrees, the Dominican Republic is a great destination for beach holidays. The Travellers Guide has a selection of 3 star, 4 star and 5 star hotels, guest houses and bed & breakfast accommodation in the Dominican Republic, listed below. Please view our hotel offers page for the latest special offers for a range of hotels in the Dominican Republic. In the first city of the new world there is a unique place in its class, Apart-Hotel Plaza Colonial. The Metro Bus Station and the Olympic Stadium are a short walk from this Santo Domingo hotel. The hotel offers the full-service Aromas restaurant and free high-speed internet access. This Santo Domingo hotel is located in the Colonial Zone, a historic district and is 3 blocks from the First Church of the Americas. The hotel offers a full service spa. Hotel Europa Boutique rooms include access to free Wi-Fi. Located one block from the Presidential Palace and 10 minutes from the Port of Santo Domingo, this hotel features a beauty salon, on-site dining, and rooms with flat-screen TVs. Each room at the Luis V includes a minibar and in-room safe. Casa Maravilla is a unique property located on a private beach in the small village of Cabarete. Surrounded by tropical gardens, it offers an outdoor pool and stylish rooms, suites and Balinese-style bungalows. This all-inclusive, family friendly resort with a full-service spa features rooms and suites with views of Bavaro Beach. The hotel has 4 pools with swim up bars, full time entertainment crew with night time show, and sauna. A 15-minute walk from Punta Poppy Beach in Las Terrenás, these apartments are surrounded by fruit trees and exotic plants. They feature a private terrace, a flat-screen TV and free Wi-Fi. El Balata Residencia offers accommodations with warm. 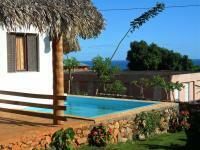 This hotel is located on the beach, just outside of the village of Las Terrenas. The hotel offers spacious apartments with free Wi-Fi, satellite TV and private terraces. Hotel Alisei features a spacious outdoor pool with a swim-up bar.